mobilerss brings RSS (RDF Site Summary) Feeds to mobile users. mobilerss enables you to view RSS News anywhere on any mobile device. Just Add your selection of RSS feeds and synchronize with your PDA. On 2007-10-08, Xonio.com published an article about mobile web 2.0 applications. People leading a life on the go are shown the best web 2.0 tools for the road. Among the recommended sites are market leaders such as flickrand YouTube. mobilerss.net was recommended as an RSS reader for mobile use along with Google mobile. Xonio.com is the leading online publication about mobile communications and computing on the German-speaking internet. Xonio.com is operated by Chip Xonio Online GmbH, a joint venture of Vogel Medien Gruppe and Hubert Burda Media. In Order to make feed reading more comfortable, mobilerss has reengineered its feed presentation engine. Due to popular demand, support for non-English feeds has been greatly improved. The new presentation engine uses the SimplePie PHP class for feed parsing and rendering. Our thanks heartfelt thanks go to the SimplePie project team for their great product! 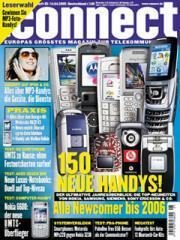 Mobilerss is being presented in the april 2005 issue of the telecommunications magazine connect. Mobilerss is mentioned on page 114 along with Avantgo and other solutions for reading RSS feeds on mobile devices. Shortly after the release of the new Avantgo 5 client, mobilerss.net was optimized for the new tool. mobilerss.net now features an improved layout which makes for easier reading on Avantgo 5 Clients. Avantgo 5 has been released to the public in december 2004 after extensive beta testing. Mobilerss was mentioned at canalPDA.com in an article about RSS readers for PDAs. CanalPDA.com is a very poular and comprehensive website for spanish pda users.